The Fluke MDA 510 and MDA 550 Motor-Drive Analysers, available from RS Components, save time and removes the trouble of setting up complex measurements while simplifying the troubleshooting process for variable frequency drives. 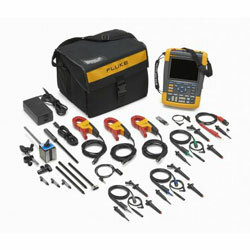 Easily select a test and the step-by-step guided measurements show the user where to make voltage and current connections, while the preset measurement profiles help to obtain all the data required for each critical motor-drive section – from the input to the output, the DC bus, and the motor itself. The built-in report writing abilities make it simple to produce professional as-found and as-left motor-drive troubleshooting reports.